6 lenses per box @ $40.13 per box. Minimum order 2 boxes. PLEASE NOTE: this lens replaces the Air Optix Aqua - it's the same lens but the solution in the lens vial has been improved. Like its predecessor the Air Optix Aqua, the Air Optix plus HydraGlyde is made from a revolutionary material that allows up to five times as much oxygen to reach the eye as a standard (non-silicone hydrogel) lens, resulting in eyes that look as well as feel healthier. 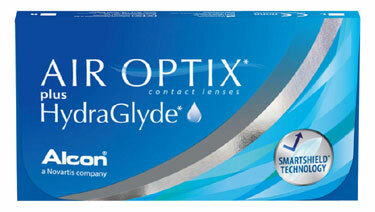 The Air Optix plus HydraGlyde has the additional benefit of Ciba's own moisture system which keeps each lens feeling fresh throughout the day by minimizing the rate of lens dehydration.